Who Won the 2009 Tavares Trade? Before John Tavares became an NHL star, he was one of the most talented offensive players the OHL had ever seen. He was also involved in one of the biggest trades in OHL history. The 2008-09 season saw the London Knights and Windsor Spitfires battle tooth-and-nail in the OHL’s Western Conference. A few days prior to the 2009 OHL Trade Deadline, the Spitfires acquired a trio of veterans from the Kitchener Rangers in order to solidify their roster going into the playoffs. In order to counter that, the Knights made one of the biggest splashes in league history, bringing in Tavares from the Oshawa Generals. Tavares had spent his entire three-and-a-half season career with the Generals. 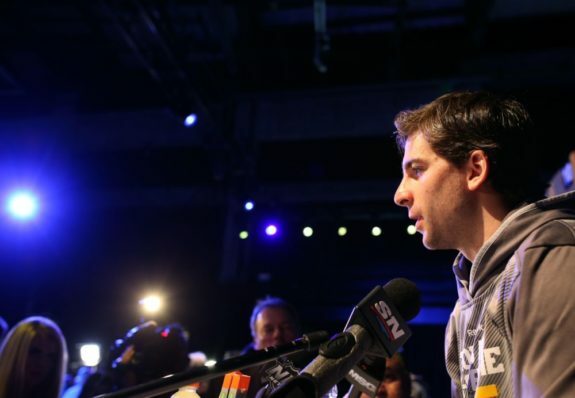 In the deal, Tavares went to London along with defenceman Michael Del Zotto and goaltender Darryl Borden. In return, Oshawa received forward Christian Thomas, defenceman Scott Valentine, goaltender Michael Zador, second round picks in 2009, 2010, 2011 and 2012, along with third round picks in 2010 and 2011. The trade was complicated, in that future draft picks require time before we can determine if they panned out. Since it has now been four seasons since the final pick was chosen, it’s safe to say enough time has passed to determine a winner. London had one goal in mind when acquiring Tavares – winning the Memorial Cup. He was an elite talent in the league and the biggest trade piece on the market. Prior to the deal, Tavares had 54 points in 32 games for Oshawa in 2008-09. After going to London, Tavares kept up his scoring with 32 goals and 50 points in just 24 regular season games for the Knights. He added 21 points in 14 playoff games. Del Zotto was just as impressive in the post-season, with 19 points in 14 games. Borden wasn’t so lucky as he saw just three games for London. For Oshawa, the three players became important pieces for their next few seasons. Christian Thomas wound up with 146 points in 212 OHL games. He was drafted in the second round of the 2012 NHL Draft by the New York Rangers and currently finds himself in the Washington Capitals’ system with the AHL’s Hershey Bears. Scott Valentine turned into a player that all teams covet; a steady, reliable defenceman that puts up some points, but keeps the opposition honest. He scored 64 points in 151 OHL games and was drafted by Anaheim in the sixth round of the 2009 NHL Draft. After the OHL, he played for Milwaukee of the AHL until 2014, then suited up for Krefeld of the DEL until this past season. Finally, Michael Zador gave the Generals what they needed in the crease which was a reliable goaltender. He wasn’t flashy, but he was reliable and kept the puck out of the net. He played 85 games with Oshawa sporting a 29-43 record. He ended his playing career in 2011 with Owen Sound, despite being a Tampa Bay prospect. While Thomas, Valentine, and Zador were impressive pieces in their own rights, the picks turned out to be quite valuable for the Generals. The second round pick in 2009 became power forward Tyler Biggs. The power forward spent two years in the USHL before being drafted by the Toronto Maple Leafs in the first round of the 2011 NHL Draft. He was sent to Oshawa, where he played one season for the Generals in 2012-13 with 53 points in 60 games. He moved on to the AHL after that but, unfortunately, he has not done much in the pros. He’s currently in the Pittsburgh system with potential for NHL playing time down the road. The second-round picks in 2010 and 2012 were well-utilized by Oshawa. They used them to acquire Niagara Ice Dogs’ prospect Lucas Lessio (#53 pictured), who became a prime goal scorer for the Generals from 2010-13. In 167 games, Lessio had 147 points and was a second-round pick by Phoenix in 2011. Since then, he spent 2015-16 in the Montreal Canadiens’ system and he is trying out for a spot in 2016-17 with the L.A. Kings. The second round pick in 2011 wound up back in London, but it did give Oshawa some leeway in that round. It allowed them to keep their other pick, which got them goaltender, Ken Appleby. He was a stalwart in net for the Generals from 2012-15, including his final season of 2014-15 which saw a GAA of 2.08, save percentage of 0.924, 38-wins and a Memorial Cup title. What about the third-round picks in 2010 and 2011? Oshawa selected two defencemen – Mitch Eden and Rory McGuire, respectively – and neither one suited up for the Generals. Eden went the OJHL route before going to NCAA, while McGuire went to St Andrew’s College. The key to any good trade is both teams getting exactly what they need. For London, it was a Memorial Cup Championship. For Oshawa, it was pieces that help the team both then and in the future. While the Knights got two stars for their title run, they ran into a Windsor team that simply could not be stopped. The Spitfires went on to win their first Memorial Cup, thanks in part to the three players they acquired prior to the Tavares deal. On the other hand, the Generals used the trade to bring in pieces that would help the team both in the present and in the future. Given Oshawa’s success for years to come, including a Memorial Cup, it’s safe to say the winner of the London/Oshawa trade that involved Tavares was the Oshawa Generals.